The sooner you realize you have bed bugs, the faster you can ask your landlord to have an exterminator come out and solve the problem. In recent years, newer chemicals and heat treatments have been developed that are highly effective in getting rid of bed bugs. However, the longer you have these insects in your home, the more there will be and the harder they will be to eradicate. Considering the San Francisco-Oakland-San Jose area is within the top ten cities for bed bug service calls in 2016, according to Orkin, this is information you cannot afford to ignore. By knowing the signs, you can communicate with your landlord right away and prevent a habitability issue. Bites on your skin: Bites on your skin can be an indicator of an infestation. These bites may be in a line or small cluster, though this is not always the case. The more bed bugs around, the more the bites may look random or disordered. While bites can be a clue, they are not proof of an infestation. Bites can be from other insects. Bed bugs tend to go for exposed areas of skin, like your arms, while you sleep. This can be a sign that you have bed bugs versus fleas that are more likely to leave bite marks on your ankles and legs. Additionally, a lack of bites is not proof that there are no bed bugs. You may not react much to their bites. Small black dots: Bed bugs start out incredibly tiny so they may appear on your furniture as small black or brownish dots. Look for small dark spots on your mattress, box spring, carpet, electrical outlets, and other dark tight spaces. Make sure to look in the seams and places other than your mattress. 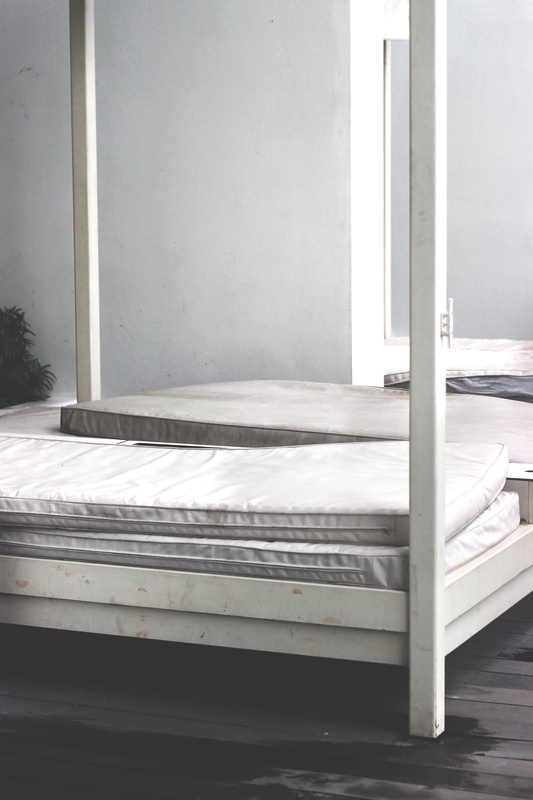 Bed bugs travel throughout your apartment, far from a mattress. Live bugs: You can also look for larger live bugs, though keep in mind these are still very small. The U.S. Environmental Protection Agency warns that if a credit card can fit in a crack, so can bed bugs. These insects are a brownish-red color. Technically, the insect is brown, but they turn red as they feed on your blood. They have relatively flat, oval-shaped bodies. They do not have wings. If your infestation is new, there may not be many adult bed bugs yet. If you do not also look for the dark spots, then you might miss clear signs of a budding infestation. Egg shells: Another sign of an infestation are extremely small eggs sacks or shells that are off-white or yellow in color. Dark spots on bedding and clothing: If there are small dark red-brown spots on your bedding, furniture, or clothing, this may be from adult bed bugs voiding blood from previous bites or from your weight crushing them. Both can lead to small rust-colored stains on fabric. Under California law, you are entitled to a reasonably clean and safe rental unit. Known as the implied warranty of habitability, the landlord cannot ever take this right away from you. Part of an apartment or home’s habitability is being free from infestations and pests. Therefore, if you are living with bed bugs and the landlord refuses to hire a professional exterminator, he or she may be violating the implied warranty of habitability, which provides you with rights such as moving out or recovering compensation. If you have bed bugs and your landlord is not appropriately responding to the situation, call Brod Law Firm at (800) 427-7020 as soon as possible. You should not have to continue living in a place with insects that bite you and your family. Our experienced landlord-tenant lawyers can work with your landlord to correct the situation or help you move on to a better living arrangement.